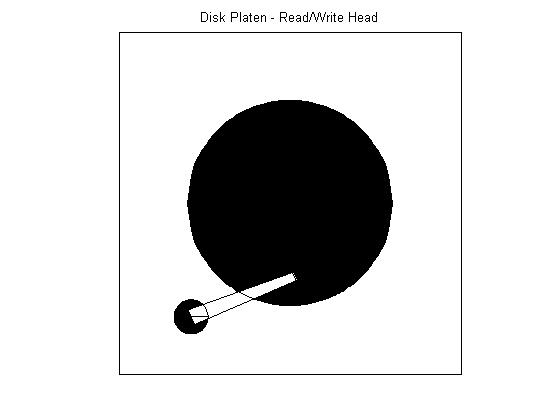 This example shows how to use LQG synthesis to design a feedback controller for a disk drive read/write head using Control System Designer. For details about the system and model, see Chapter 14 of "Digital Control of Dynamic Systems," by Franklin, Powell, and Workman. Below is a picture of the system to be modeled. The model input is the current driving the voice coil motor, and the output is the position error signal (PES, in % of track width). To learn more about the 10th order model, see Digital Servo Control of a Hard-Disk Drive. The plant includes a small time delay. For the purpose of this example, ignore this delay. In this example, design a full-ordered LQG tracker, which places the read/write head at the correct position. Tune the LQG tracker to achieve specific performance requirements and reduce the controller order as much as possible. For example, turn the LQG tracker into a PI controller format. Open Control System Designer, importing the plant model. By default, Control System Designer displays the step response of the closed-loop system along with Bode and root locus graphical editors for the open-loop response. Maximize the step response. Double-click the IOTransfer_r2y: step plot tab. Details about how to use the Control System Designer are described in Getting Started with the Control System Designer. The default unity gain compensator produces a stable closed-loop system with large oscillations. Click Tuning Methods, and select LQG Synthesis. Controller response - Specify the controller transient behavior. You can make the controller more aggressive at disturbance rejection or more robust against plant uncertainty. If you believe your model is accurate and that the manipulated variable has a large enough range, an aggressive controller is preferable. Measurement noise - Specify an estimate of the level of output measurement noise for your application. To produce a more robust controller, specify a larger noise estimate. Desired controller order - Specify your controller order preference. Use default slider settings as the initial controller design. Click Update Compensator. The new Compensator is displayed, and the step response updates. To design a more aggressive controller, move the Controller response slider to the far left. The more aggressive controller reduces the overshoot by 50% and reduces the settling time by 70%. To create a PI controller, reset the Controller response slider to the middle default value, and set the Desired controller order to 1. This controller produces a heavily oscillating closed-loop system. To make the controller less aggressive, move the Controller response slider to the right. 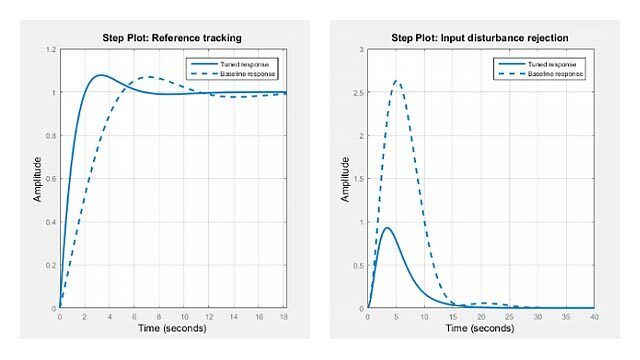 The step response shows that the PI controller design provides a good starting point for optimization-based design. For more information, see Getting Started with the Control System Designer.